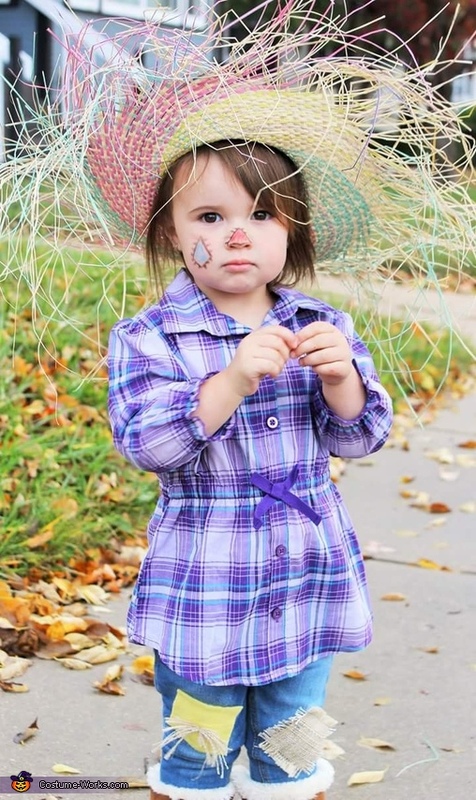 Leighton, our daughter, who will be 2 in November is dressed as a Scarecrow for Halloween 2015. I came across this idea while browsing a thrift shop and finding this gorgeous hat, for $2! I couldn't pass it up. I found her flannel shirt at Walmart for $6.95. We used Halloween makeup from last year, to give her the "patches" on her nose and cheek. We used remnant fabrics from JoAnn Fabrics (yellow fleece and burlap scraps) to make her patches on her jeans. These jeans are actually crop pants from this past summer that will be too small to wear after this season...so I didn't have any issues (ruining them) using fabric glue to get the patches to stay on.